In the past, all homes had a table in the kitchen. It was a place where people had every meal, sat to read the newspaper and had family gatherings. As years passed over, the island has become a more popular choice for modern kitchens. It is true that both of them have their benefits, but there are some occasions when kitchen tables give island some serious competition. Islands tend to be blocky and monolithic. Tables, on the other hand, allow a greater feeling of space. Plus, an island can be a big commitment as it is a permanent fitted fixture you can't easily undo. With a table, you can feel freer to experiment with different styles as it is easy to swap in case you change your mind. And talking about experimenting different styles, tables come in huge variety of styles and materials and this means you can choose something dramatic, quirky, or special for a more interesting kitchen look. Islands are meant for hard work, so they are often designed to be functional aesthetic rather than to be stylish. A chic table can add a designer edge to your space, making it feel homely and inviting. For example, a wooden refectory table can add character to a modern rustic kitchen while still work as a place to slice, chop and knead. If planning to use the table as a work surface, look for a higher-than-average table model to avoid bending over all the time. For a flexible seating solution, pair the higher table with industrial-style stools that are height-adjustable. Some kitchens are just too skinny for an island. 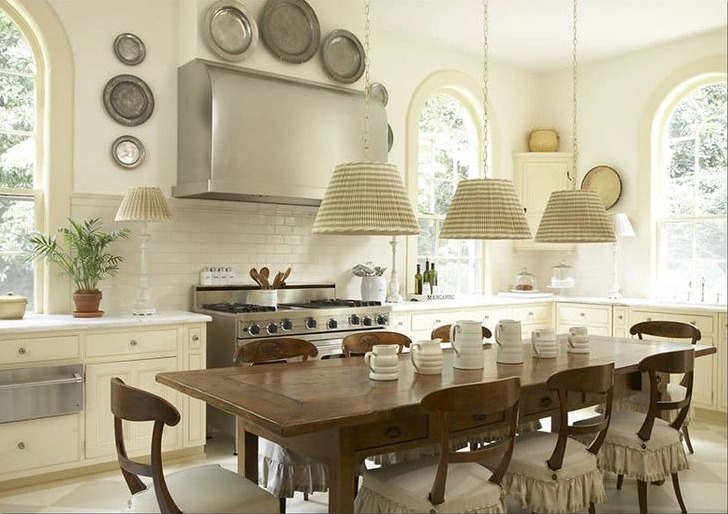 With some smart design touches, a small kitchen can accommodate even a large table. For example, if you choose low, compact stools that slot underneath the table and handleless cupboard door to keep the units streamlined, you might have enough room to walk through the space. Islands are sure a great way to separate cooking and dining spaces. However, not all kitchens can be divided in this way and not every home has a separate dining room. Using the entire room, instead, as one combined-dining space can make the room seem bigger and maybe even allow for a bigger table if you like to entertain. The first and most important step when purchasing a table is to measure the space where you are planning to place it. Keep in mind the space around the table to make sure you will have plenty of room to move around the table and sit down.